One of the goals of MLER is to demonstrate ways to bring exciting new research results into instructional activities at all levels. 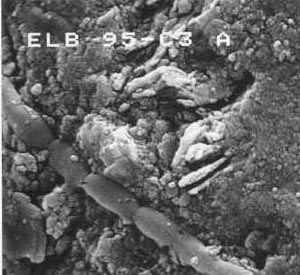 Cryogenic-SEM image of phormidium growing on mineral substrate, sampled from ice from east Lake Bonney, an Antarctic dry valley lake. Image by David Mogk and sample provided by John Priscu, Montana State University. Tips on Partnering, between scientists, educators, and curriculum develops. Tips on Assessment to demonstrate impacts and outcomes.